06 Amanu includes notes of blood orange, green galbanum, lentisque (mastic), cedar leaf, jasmine sambac, magnolia, amberwood, musk and “live” moss. 06 Amanu starts off with biting citrus and sheer galbanum; the opening is lively and short lived. As the scent dries on skin, I smell mastic and a combination of floral aromas that conjures a “tropical” blossom (put your nose to skin and you’ll detect jasmine). There is a vegetal “freshness” pulsing in the head and heart notes of 06 Amanu (live moss? “young” cedar leaf?) As the perfume segues into its final stage of development musk comes to the fore (thankfully, NOT strong, cheap-smelling, ‘laundry’ musk, but a semi-sweet ‘flora-green’ musk). When sprayed lightly on skin (I’m talking to those of you who think one or two spritzes of fragrance are sufficient), 06 Amanu is an airy perfume…crisp, summery, a tad sweet. If, like me, when you encounter a light fragrance, you begin to pump the perfume nozzle wildly (let’s say 10 to 15 times), you will get a completely different 06 Amanu experience. When applied heavily, 06 Amanu presents, in addition to the aromas mentioned above, wisps of incense-smoke and damp earth. 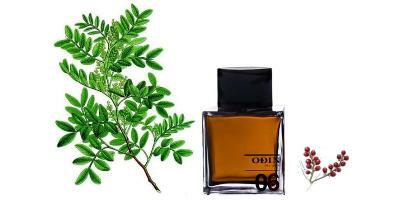 06 Amanu, even applied lavishly, is not a particularly long-lasting perfume, and it has minimal sillage. 06 Amanu would fit perfectly into the Hermès “Jardin” series of perfumes; if you’d like a lower-wattage cross between Hermès Un Jardin en Méditerranée and Un Jardin Sur Le Nil, give 06 Amanu a try. Odin New York 06 Amanu is available in 100 ml Eau de Toilette ($110); for buying information see the listing for Odin under Perfume Houses. Note: top images of Pistacia lentiscus [altered[ via Wikimedia Commons. I look forward to smelling this – the others in the line didn’t excite me at all, although honestly I didn’t give any of them sufficient skin time. Giacobetti is the nose for this one, no? MikeP: no perfumer’s name was in any of the PR I received…so don’t know…. Uh… whoops… I was putting my eyeballs back into my head. 10-15 spritzes? Whoa. I should live more dangerously. I’m with you Mals! I’m a 3-spritzer, one on each wrist and one in the neck/chest vicinity. Odonata: apparently you both IGNITE & RADIATE scent much more than I! HA! I do one spritz behind each ear, and one on the inside of each elbow and wrists. I am ok with frags lasting 4 to 6 hours. Mals…that’s with a LIGHT fragrance! Adjust your eyeballs. I had sort of given up on this line, but this one sounds worth a sniff – or – why NOT 10-15 sprays? I was feeling sort of bad for the live moss and young leaves – cut down in their prime of life! (cue sad violin music) …although I suspect that “young” may mean no Bryophyta were harmed in the making of this perfume. Noz: HA! One way to honor the too-soon-killed moss is to perform MEGA application of the scent: my tribute. Another way to read the “live” moss I guess is to imagine it growing in the bottles…! Kevin, this sounds like an idea Christopher Brosius could really run with: I’m imaging his water perfumes with living things in them! Are there any pleasant-smelling algae, for example? Someday we may have to remember to FEED our fragrance collections!